Day 1: D-Day has arrived! Well, the day is finally here – the dig commenced today. Crew came from far and wide and gathered at the bottom of the Donore Road in Drogheda before travelling the final leg of the journey through the byways of Meath to Rossnaree. 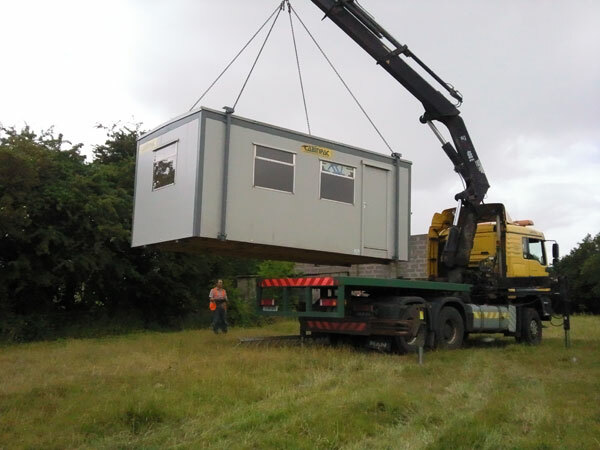 The dig cabin is craned into position. Lots of sorting out was done – our equipment for the four weeks was delivered and the first piece of equipment to be used was the gas ring and kettle. I had been tipped off that this is the most important item to have on the dig, especially on the first day (thanks Ger!). The all-important cabin arrived at lunch-time and was craned into position after which we bagan to feel that a real dig was about to happen. This will be mission control for the next four weeks and will function as cantine/office/rain shelter as the occasion requires. 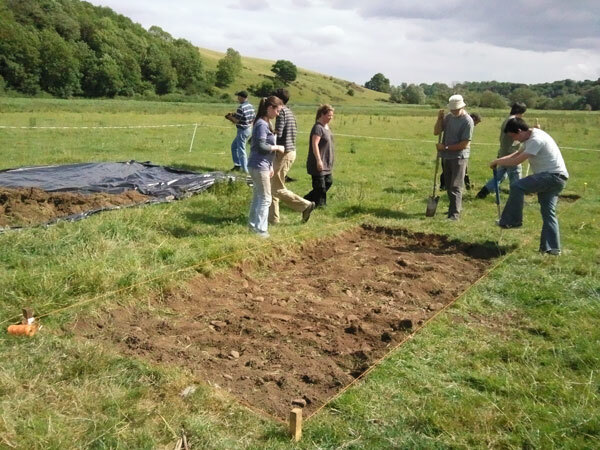 Down on the site, the positions of the trenches had already been established so we checked them and fixed some of the corner posts that had been disturbed by the resident cattle. We strung up the orange builder’s line to define the edges and started the laborious process of desodding. The crew pitched in and we made short work of this unrewarding part of the process. I was very impressed that nobody chose to tell me that the Time Team use JCBs for desodding! Hopefully we will be encountering more interesting material soon.